Let your congregation relive your sermon word for word and slide for slide with Proclaim sermon audio recording. It's quick and easy to record your sermon and share it to Faithlife Sermons, iTunes, or your own church website. Check out our instructional video, or follow the steps below to get started recording and sharing your sermons today! Before recording you may need to configure your audio recording devices. After your device or devices are plugged in, navigate to the Settings menu at the top of the screen and select the Audio tab. Choose your input device and test the playback by recording a quick sample. Proclaim lets you choose the sections of your sermon to record and automatically pauses recording outside these sections. When your sermon is complete, you'll be left with a single audio file that includes all of the recorded sections. To add Start and Stop Recording Cues to your presentation, select the Add Item menu at the top of your screen. On the right side of the menu are your recording cues; these will be added directly into the order of service on the left. 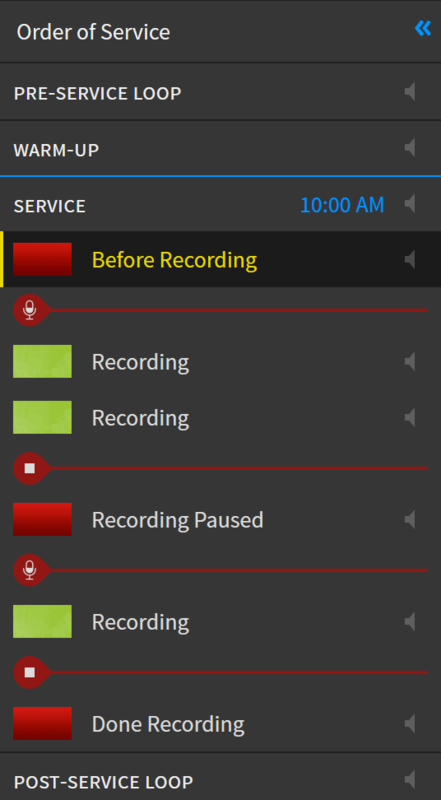 You can have multiple Start and Stop recording cues; Proclaim will start and stop recording appropriately. Just like any other service item, recording cues can be dragged and dropped anywhere in your presentation. When you navigate to a service item between a start and stop cue, Proclaim will be recording live. Navigating past a stop cue will pause your recording, which will resume again if you pass a start cue. Proclaim records your slides right alongside your audio! Anything your audience sees and hears during your sermon will be available as a part of your audio or video recording. 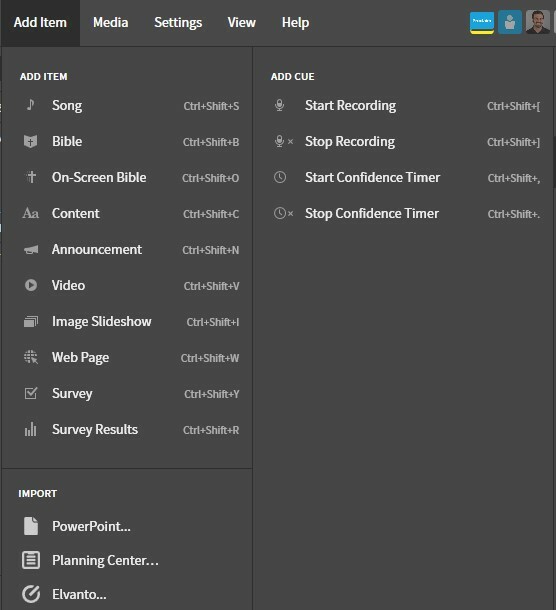 When you go off-air Proclaim will stop the recording and open a window that allows you to edit and publish your sermon. Note: If you hear something you'll want to remember later, press the "m" key to drop a marker in your recording. Use these orange tick marks reminders to edit out your pastor's cough, or mark the section you'll want to use as a soundbite. Before you publish your sermon, you can still edit the recording and the accompanying information. Upload a cover image, give the sermon a title and set the speaker who delivered the sermon. Did you know? You can select the speaker's faithlife.com account. Just start typing their name and choose from the list of populated users. You can experience all of this speaker's sermons on sermons.faithlife.com. Only want part of your recording? You can trim and publish a single segment, or include the whole sermon; anything between the blue arrows will be published. Grab a soundbite from your recording that represents your sermon in sixty seconds or less; when you publish your sermon, your congregation can easily recognize each sermon by its soundbite. Just drag the orange arrows to the segment you want to represent your sermon. When you've decided exactly what you want, publish it! To publish audio within Proclaim you will need to set up a Faithlife Church Group. Your Faithlife Church Group is great not only for publishing your sermons, but also for connecting your congregation with communication tools. If you do not already have a Faithlife Church Group, don't worry; it's fast and easy to set up, just follow the steps in this article. When you publish your sermon it becomes available to Faithlife, Faithlife Sermons (formerly Soundfaith), iTunes, and your church website. Follow any of the links in the publish window to learn more!